*On September 13-15, 2018, 5 PMA students tested for and earned their Black Belts in FILKENJUTSU Kenpo. Today is our final post from a series that were written by PMA’s newest Black Belts during their preparation for Black Belt. Today’s post is from Monty Blalock. Monty is 48 years old and has been training at PMA for 6 years. A good martial arts library and resources from which to draw can enhance your martial arts training that you receive on the mat. The path to learning a new skill first starts with the curiosity or desire to do so. Then once you begin your learning process, you should put in the work to become better day-by-day. That requires work inside and outside of class. As it relates to martial arts, work inside of class is easy to identify. It is the time you spend on the mat with the instructors. The work outside of class is more subjective and depends on the individual. It can be practicing on your own or with others outside of class, it can be taking notes to document techniques learned, or it can be research done on relevant topics, concepts, history or philosophies that supplement what is taught by instructors. I’m not a life-long practioner of the martial arts. At least I wasn’t, but I am now. What I mean is that I have been a fan of the martial arts, much like any kid growing up in the 70’s. Except for a year or two of Tae Kwon Do as a youth, my time on the mat didn’t really start until I found PMA in July 2012. As an over 40-year old man at the time that sat behind a desk crunching numbers, my original goal was to take the plunge into martial arts as a means of physical fitness and to explore Brazilian Jiu-Jitsu (BJJ). Whatever miniscule amount of information I thought I knew about the stand-up martial arts, I knew significantly less about the grappling arts. So I went to Google and typed “Brazilian Jiu-Jitsu near me”. My wife and I had just relocated from Michigan to the Knoxville area. Our transitional apartment, while looking for a house, was in Oak Ridge. Depending on your belief system or personal philosophies, there were other forces at work. Call it fate, destiny, divine intervention, etc. I will elaborate more on that in a moment. The PMA website was the first one that popped up. Since I had zero knowledge about what to look for in a martial arts academy, I called the first one. SiFu David Corrigan answered. Via phone he was professional, courteous and nice. He scheduled me for an intro lesson a few days later. In our first meeting, he informed me that the foundational system his school taught was FILKENJUTSU-KAI, developed by his father SiJo Bruce. The system is based on Kenpo karate at its core, but it included other aspects of martial arts, including BJJ. Although I was initially only interested in BJJ, his family’s system intrigued me. Plus SiFu said that at that time he recommended that all students start in Kenpo, then at yellow belt, you could begin the BJJ curriculum. Ok, I’ll give Kenpo a try, if for no other reason, than to learn a few cool techniques, until I could start BJJ. Remember I mentioned fate, destiny, and divine intervention earlier. Well the latter is my preference in case you wanted to know. That moment put me on a path that I’m truly thankful I embarked upon. It led me to this moment as a FILKENJUTSU Black Belt Candidate. There have been a lot of moments in between these two points and I’m hopeful there will be many more (a lifetime’s worth to be exact). Now to get to the crux of the matter. I’d like to touch on a few things that are relevant to me and how they relate to my development as a martial artist and as a person. Monty (far right) with a few of his training partners! In my opinion, I’m not the best martial artist physically, but I try hard, for a middle-aged guy with a constant foot, knee and ankle issues. But I’m still here. What I lack in physical prowess, I try to make up for in organizational skills, positive attitude and having good resources from which to draw upon. It also helps that I understand my own learning style. According to the website (www.learning-styles-online.com/overview/), there are seven types of learners. Now many of us are not just one type, but we are a combination of some or all of these. But we all have preferences. Based on the definitions above, what works for me starts with the verbal and logical. I don’t discount any of the others as I apply them to my martial arts training, but after the techniques are taught by the instructor(s), I initially process them along the verbal, and more specifically the written aspect. Then of course there is the physical – meaning repetition, which locks it into muscle memory. Then I look at the techniques through a lens of logic, which helps me understand the “why” of the techniques. And the why leads me to develop a deeper understanding. To gain that deeper understanding, you should find resources that help you do just that. Just like any other subject you learn in school or in your profession, you have to do some learning on your own. I only bring this up so that if you haven’t done so already, think about your learning style and adjust your practice and training outside of class accordingly. Then do your research! I’d like to touch on a few things that are relevant to me and how they relate to my development as a martial artist and as a person. Monty alongside two of his training partners and fellow Black Belt candidates, Iain Willborn and Matt Thomas. WHAT IS IN YOUR MARTIAL ARTS LIBRARY? I choose to supplement my training on the mat with a host of other sources. I call those resources “My Library”. My library includes notes, books, information, motivational sources etc. that help me along my journey through martial arts and life. By no means am I suggesting that you use books to “learn” techniques. But instead, use books and other resources to generate the appropriate level of curiosity as an add-on to the tutelage you receive from our instructors. When I began my martial arts studies, the material was (and is) taught in such a way to make you thirsty for more. It is given in small, manageable chunks. Take the opportunity to study and practice those techniques, instead of being in a hurry to stockpile or accumulate techniques. When I first came to PMA, I remember asking SiFu what books he would suggest I read in order to become a little more enlightened about martial arts. Instead of answering directly, he took me into his office and showed me his bookcase. If you’ve never had the pleasure, ask him to show you sometime. Me being a book guy, I thought I had just entered martial arts section at the library or bookstore. The variety of topics was impressive. This made me start thinking about martial arts in a totally different way versus just coming to class to learn techniques. I wanted to know some history. Over my years of training at PMA, I periodically look at SiFu’s bookcase every time I’m in there. This started me on a path to creating my own library one book (or resource) at a time. Your library can get you through in a variety of ways, as I describe in the sections below. A snapshot of Monty’s martial arts bookshelf. The style of martial arts that we study is comprised of hundreds of techniques. It can be difficult to recall everything that we have learned during our training just from memory alone. According to a Harvard research paper on note taking, you should review your notes on the same day you created them and then on a regular basis, rather of cramming your review into one long study session prior to an exam. (Friedman, p.3). This helps improve retention and makes it easier to study the material in the future. I try to document my notes from the martial arts classes attended as soon as I can after class. This lets me reflect on the techniques learned, and document them as accurately as possible. I also include my questions to ask the instructors for details that I may have missed. (I’m not saying that I take the best notes, but they work for me. If you’ve ever seen mine, you understand what I’m saying). If you haven’t started, I suggest you take notes after each class to add to your library. Monty always goes out of his way to help out around the dojo anyway he can! To me a belief system is multi-pronged. It means faith in something greater than yourself. It could mean religion, philosophies, ethics and/or moralities that exist within you. The martial arts are filled with these themes in almost anything you pick up related to the topic. One of the first books I obtained during my martial arts training was Zen in the Martial Arts by Joe Hyams. Early in the book the author mentions how the aspect of Zen had been underrepresented in the martial arts literature. He quotes “Yet I had studied the martial arts for several years before becoming aware of this [referring to the Zen principles]. In the early stages of training, like most students, I spent my time learning and refining complex physical techniques and movements. Only occasionally did a SiFu (‘instructor in Chinese’) hint that there were other lessons to be mastered” (Zen in the Martial Arts by Joe Hyams p.9). Just like Mr. Hyams mentioned in the quote above, our own instructor - SiFu David has mentioned this book and periodically reads passages in class. This book helped me think of martial arts on a deeper level, much more than just the physical. Monty and his wife, Mitzi! One of they key components of martial arts training is a supportive spouse! For those that study martial arts within the FILKENJUTSU system, you know that there are some physical and mental demands that you encounter in class, belt tests, etc. There are times that you feel as if you can’t go any more. A lot of that is your mind telling you to stop. Yes, your muscles and joints could be in some mild discomfort, but if you push yourself past that point, you will be amazed at yourself. But to get there, sometimes you need to distract your mind while your body keeps going. I suggest you find things such as a mantra, phrase, song, or poem. One of the things I have in my mental library is a poem that has some significance to me called See it Through by Edgar A. Guest (Poets.org). It speaks to getting through tough times. It can be applied to any FILKENJUTSU belt test or life in general! Monty on a fall hike with some of his instructors and training partners. The FILKENJUTSU official websites at our disposal (fusionmartialarts.com and pmaoakridge.com) should be your starting point for system knowledge. Then you can delve deeper into our history. As I began to build my library, I found myself migrating to books related to the history of Kenpo, in addition to the other arts that make up FILKENJUTSU. KAJUKENBO, one of the systems that FILKENJUTSU is derived from, has a rich history that all Kenpo students should be aware. SiJo Bruce has done an outstanding job in keeping and/or bringing back historical aspects and traditions that tie directly back to KAJUKENBO. Monty alongside FILKENJUTSU founder, SIJo Bruce Corrigan, at one of the Black Belt Test Luau’s! In conclusion there are many sources from which to draw additional resources related to your martial arts path. I choose to supplement my training on the mat with a host of other sources. I call those resources “My Library”. My library includes notes, books, information, motivational sources etc. that help me along my journey through martial arts and life. Do you have a library? If not, I suggest you start one today! 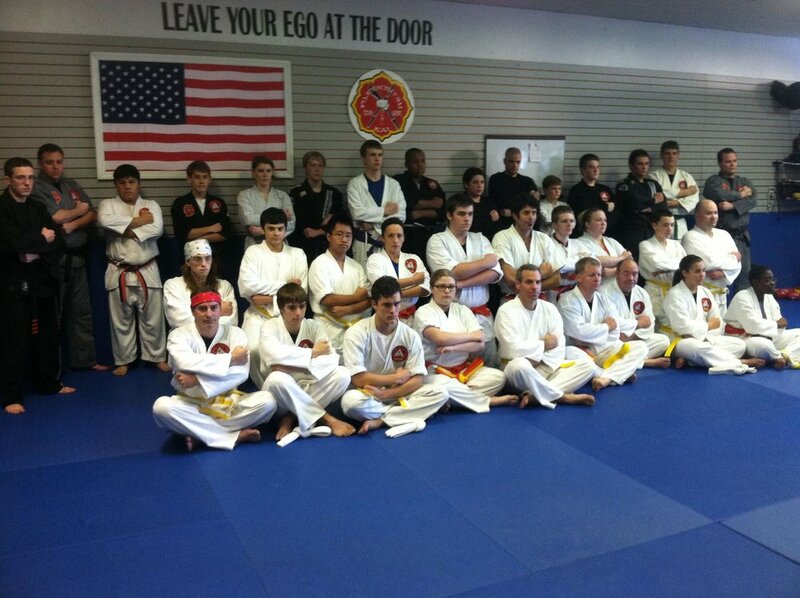 Monty alongside his fellow Black Belt candidates after receiving their Black Belts on the 3rd day of their test! Lee, Bruce (1975). Tao of Jeet Kune Do, p.3. Website: (www.learning-styles-online.com/overview/), Seven Learning Types. Website: (www.poets.org), See It Through by Edgar A. Guest. Bishop, John (2006). KAJUKENBO, The Original Mixed Martial Art. Bishop, John (2011). KAJUKENBO, The Emperado Legacy. Tavares, David (2017). The Black Robe: The Kenpo/KAJUKENBO Connection. Website (www.rightattitudes.com/2016/06/26/pearl-s-buck/). Quote from Pearl S. Buck. *On September 13-15, 5 PMA students tested for and earned their Black Belts in FILKENJUTSU Kenpo. 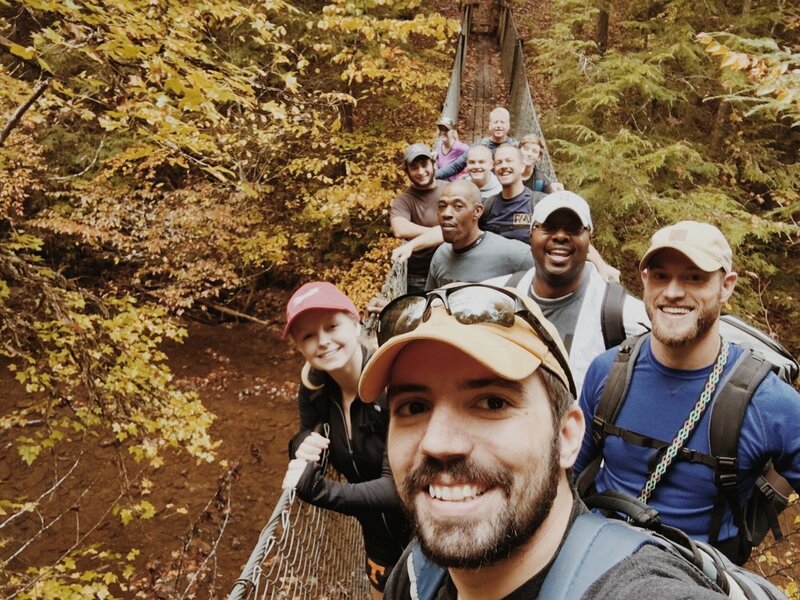 Follow along over the next few weeks, as we share some blog posts that were written by PMA’s newest Black Belts during their preparation for Black Belt. First up is Iain Willborn. 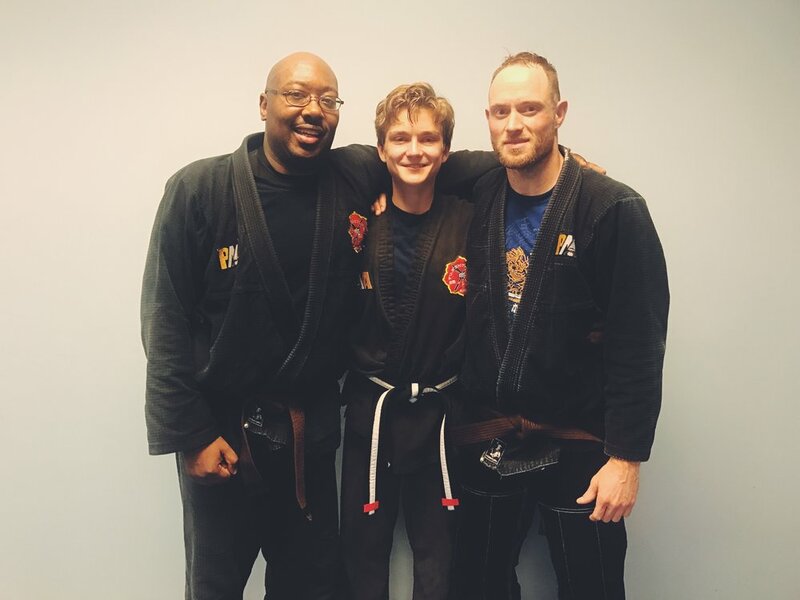 Iain is our academy’s first person to begin training as a child (Iain started at 11), earn their Junior Black Belt, and then take the 3-day test to earn their full Black Belt upon turning 18. Hopefully the first of many! Enjoy! One may observe the phrase “martial arts is a way of life” and think “No, martial arts is nothing more than a hobby, through and through,” and to be honest, when I was younger, I would have fallen into the group of doubters. Can you find Iain in this 2013 photo? He is the 5th from the right in the back row! I was one of the people that do not see martial arts for anything more than basic self-defense and exercise. But when you look deeper, martial arts, in my case, FILKENJUTSU, has a plethora of knowledge and lessons hiding just under the surface. Respect for authority is just one. The humbling experience you receive on a class to class basis through the teachers and the curriculum is another. As you are told often, “a martial artist’s journey is never done,” and indeed there is always more to learn, whether physically or mentally. 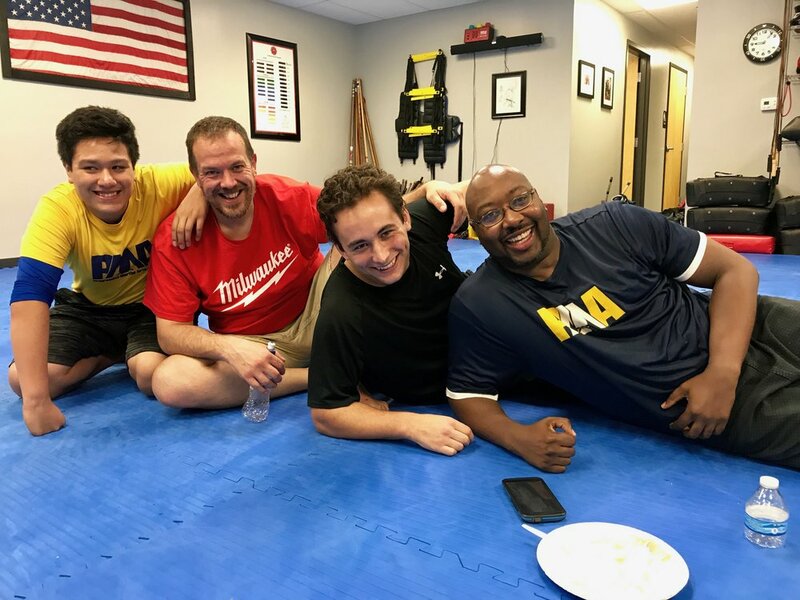 The self-control, the ability to be a gracious winner and an even better loser, and then the true feeling of comradery between one another are just snippets of what martial arts, especially taught through PMA, have opened my mind to over the years. I never wanted to train in martial arts in the first place. I was lovingly forced into it by my parents, who hoped it would not only give me some well-needed exercise, but also aid in my anger management issues. And I thank God that they did because it’s been one of the primary means that He has used in my life to this day. As a lazy, angry child, I saw absolutely nothing good about PMA, other than it was something cool to tell friends about. But looking back at that little boy now, I can see that PMA is exactly what I needed, and exactly what God wanted for me. The investment that my parents made in classes for me over the years has been priceless in my life. My journey through Progressive Martial Arts has ranged years, and I’ve had many different attitudes towards it during that period. I’ve gone from not wanting to do it, to only doing it for fun, to doing it for fitness. But all these have been leading me to where I have landed and settled over this past year, wanting to do martial arts for life, wanting to learn more, and continuing to improve my skills. August 2015 - PMA's first group of Junior Black Belts! For almost the entirety of my martial arts life thus far, I have been more of a punch and kick oriented fighter. My newest passion, however, is the entirely different fight that happens on the ground, Brazilian Jiu Jitsu. When I first started martial arts, I did private classes in which I learned some basic Jiu Jitsu. As I continued to train, however, I eventually started doing group classes in the juniors, then to young adults, then finally to where I am today, the adult Kempo class. In the juniors and young adults, Jiu Jitsu was taught very minimally. So, for years I was in a stagnant state concerning groundwork. I knew the basic positions, and basic movements, but I never practiced them, and I never thought of them very much honestly. But just within the little time that I’ve been training Jiu Jitsu seriously, about a month and a half, I’ve learned just how wrong my outlook was. My mentality concerning my lack of Jiu Jitsu training through the years was as simple as “I won’t ever let someone take me down, so I don’t need to know Jiu Jitsu,” which is crazy! One must observe that I drastically overestimated one thing, and that was my skill as a fighter. Over the two years that I have been in the adult’s class, my lack of skill in controlling a fight has been demonstrated to me time and time again, and that is just in a civil sparring match! I now realize that I will never be quick enough, or smart enough to guarantee that I won’t be taken to the ground during an altercation. Like SiFu David regularly reminds us, “Action is faster than reaction”. So, moving forward now, what is my goal for Jiu Jitsu? My goal for Jiu Jitsu, as is my goal for any aspect of a fight, is to learn how to survive. I simply seek to gain the ability to last through the fight, whether on my feet or on the ground. But another more exact point of interest for me is submissions. The art of controlling your opponent, whether to injure or to simply stop them from injuring you has fascinated me. As a person that trained for years thinking about fast, powerful, and rigid strikes to control an opponent, seeing the fluid art of chokes, key locks, and triangle chokes (just to name a few) has opened my eyes to a side of the fight game and martial arts that has been out of my reach for years. I am looking forward to learning and honing these skills moving forward in my martial arts life, and becoming a more well-rounded martial artist. August 2015 - Iain’s Junior Black Belt Test with his classmates and instructors. The anger that plagued my younger years is still a fault I continue to battle even now, but it is not the destructive hellfire as before. It is now in the form of constructive discontent. Instead of firing my failures, insecurities, and sadness out at the poor souls around me, or destroying myself mentally, I use it to fuel my desire to always be improving, always learning, and always helping others. My hope and dream moving forward is to be a part of the family at PMA, and to be there to support and uplift others as they are embarking on their own journeys. December 2016 - Iain tested for his first degree on his Junior Black Belt, alongside Monty Blalock and Matt Thomas. At PMA, when a child reaches Brown Belt but is not old enough to take the Black Belt test yet, we test them for a “Junior Black Belt,” which is the belt you see in this photo with the white stripe. Then, they can earn degrees (the red stripes) on their Junior Black Belt, until they turn 18 and are selected to take the test for their full Black Belt. I will move forward in the race that is this life to learn how to handle myself with honor and dignity, so that one day, I can master the avoidance of battle and strive for peace. The work ethic that I have learned from my parents, my church, and PMA has enriched every aspect of my life. Those three things have sculpted who I am, and who I’m striving to be. PMA is one of the building blocks that is there to support the growth of who I am, and I will continue to build on those foundations for the rest of my life. Iain amongst his FILKENJUTSU Black Belt family! I couldn’t be more thankful for the people that have aided me along this journey, especially in the early years, like SiFu David and SiHing Terry. They have been there to lift me up, but also correct me when I was wrong. Their commitment to me, and my fellow students, has left an unperishable imprint on who I am and how I carry myself today. I’m never going to stop pursuing my callings and aspirations, even when faced with failure and hardship. Last week I was talking to one of our adult students that will be turning 50 this year. We had a funny conversation that comes up fairly often when teaching martial arts about how he could beat up his former self. This student didn’t start training until his late 40s, but now that he has been training for a few years, the skills he has acquired would enable him to defeat his 30-year-old, stronger, faster, younger self in a fight. 1. You are training martial arts. In this scenario, the percentage of people in the world that would beat you up in an altercation is decreasing year after year. Or depending on your age, at the very least it isn’t increasing as quickly as it would be without training. 2. You are not training martial arts. In this scenario, the percentage of people in the world that would beat you up in an altercation is increasing year after year. Sometimes, when talking to someone over the age of 35 or so, they make the assumption that their time to train has come and gone. In all actuality, that is never the case. No matter your age, 35 or 75, it is important to train for self-defense (and so many other benefits). While you should always try to avoid a fight, through training you are increasing your chances of being able to survive an attack. Sometimes people say they will just keep themselves out of situations that they might need to fight. That’s really good - I will too! Unfortunately, sometimes there are situations we cannot avoid. As we’ve discussed in previous entries, men can avoid many altercations as long as they check their ego and alcohol consumption. But not all. And if you are a woman, you have an even more important reason to train, as there is a much greater chance that you could be targeted in an abduction or sexual assault. So, how would 50-year-old you fare against 30-year-old you? I can GUARANTEE that 50-year-old you will be much better off if he/she is consistently training. Being successful in any aspect of life does not mean always being right, always winning, and always doing things by yourself. It is okay to not know an answer. It is okay to lose. It is okay to ask for help. It is even okay for these things to happen when others expect them not to. This barrier that people put up and think is making them appear to be all-knowing and perfect, is actually the thing that not only adds unnecessary stress and anxiety to their life, but keeps them from reaching their goals. The mindset we should strive to develop is giving a perfect effort, but being okay with a less than perfect result. Trying is good enough, and then we can learn from and build from our experience. You don’t have to pretend you know something that you don’t. You don’t have to be afraid of losing or making a mistake. On the mats, this mentality pops up and every student would get so much more out of their training if they could eliminate it. Every time I see a higher rank begin “coaching” their training partner at the slightest sign that the lower rank student might be doing something well, inside I am cringing and shaking my head in disappointment. Don’t do this. It’s okay to lose to or get help from a student that is a lower rank than you. It only means that this student is also receiving good training - it does not mean that anything is wrong with you. In fact, you will get better by allowing these circumstances to happen and getting the most out of them. Your fear of losing is putting you in a position to lose more. More growth comes from situations that we don’t know what to do, accept that, and then learn from it, than when we put on an act as if we know what to do. You will not get things right on the first try, but try anyway. You will not know every answer, don’t pretend like you do. You will need help from other people who have experienced what you are experiencing, don’t be afraid to ask for it. FAQ: Why Do We Train Barefoot? This is a common question we get from new students. What is the deal with not wearing shoes!? Do I have to take my shoes off? The practice of training martial arts without shoes goes back really far but actually has a much more logical purpose to it than just tradition. While it is traditional in most of the arts we teach to train without shoes, it is not uncommon to look back in history and see some arts that train with shoes on. In many Chinese arts, practitioners often chose to wear shoes and most believe this to be because of the rocky or uneven land that they would sometimes train on. Whereas maybe on the island of Okinawa or the beach in Brazil, students were training on soft sand or grass and would choose to train barefoot. Practical. And hey - we know Bruce Lee’s shoes were an iconic part of his image, so he obviously wore shoes often when training! You could even argue that it is beneficial to train with shoes on so that you know what it feels like if you have to defend yourself while wearing shoes. And it is definitely different! For this reason, we take out students outside and train with shoes on sometimes. So why do we choose to go without? The two most important reasons are hygiene and safety. We ask that students wear shoes to and from the dojo and remove them just before stepping onto the mat. We teach Brazilian Jiu Jitsu and spend a good amount of our time grappling on the mats, and therefore need to keep them sparkling clean. In fact, the mats you train on at PMA are some of the cleanest you will find around the world because we put so much focus on this. Some of our students and teachers that have visited other academies around the world report that they often are training on layers of dust, hair, and dirt! Please clean your feet, wear shoes to the dojo, and remove them just before stepping onto the mat to keep as many germs, dirt, etc. off of our mats as possible! *Please remember to throw some shoes back on if you are going back out to your car or something! And if you see a student coming in from outside barefoot, consider giving them a gentle reminder to help keep the mats clean. You can send him to this link to read up if needed! And if you want to wear the official flip-flop that most students in Brazil wear to and from class, get yourself a pair of Havaianas! The added benefit of a flip-flop is you can slip it on easily when using the restroom or stepping off the mat to run out to your car during class. Even running into the restroom barefoot in the middle of the class will bring germs back onto the mat. With kicking and grappling being taught, getting hit with a shoe does much more damage than a bare foot! Training without shoes enables us to make a little more contact on our kicks with each other, and have far fewer accidental injuries when grappling because we aren’t being hit with any hard heels or steel-toed boots! Only wear your training shoes on the mats. Never wear these shoes off of the mats or you start bringing in all of the junk we are trying to keep off the mats. Wear the right shoe for the job. While practicing striking arts, you will need a shoe that is designed to allow you to pivot your foot freely. If you wear a shoe with too much grip, over time you may find yourself with a knee injury. While practicing grappling arts, we ask that you wear a soft shoe, designed to keep your partner safe - such as a wrestling shoe! These are not good for striking. They are designed to grip the mats more effectively, which gives you the ability to drive your weight into your opponent more effectively and your foot not slip out from underneath you. For grappling, any wrestling shoes should do the trick! In closing, I personally have grown up training barefoot, and I love it. Getting to feel the ground beneath you while training strengthens your balance and stabilizer muscles that will help prevent injuries when you have an occasional misstep or step off of a curb funny. I now hate wearing shoes! FAQ - What is a Red Belt? One of the purposes of this blog is to answer some of the frequently asked questions from our students, parents, and others interested in the martial arts, self-defense, or just health and fitness. In the martial arts world, one of the things that people are often most curious about is the belt system. What do the different colors mean? How long does it take to get them? Why do various arts have different colors? Today, let’s take a minute to clear up the Red Belt. In some Korean martial arts, you will see a red belt used as one of the standard colors leading up to the Black Belt. That is not the red belt that we are discussing today. The red belt that everyone is curious about is the one you see the “old guys” sometimes wearing. Different martial arts use it in different ways, but most commonly, you will see the red belt worn by someone who has reached 10th degree in their particular style. 10th degree is the highest rank achievable. Two of the primary martial arts taught at Progressive Martial Arts Academy are Kenpo and Jiu Jitsu. Specifically FILKENJUTSU Kenpo and Brazilian Jiu Jitsu. Kenpo has many different groups, and all have decided on different ways of using the ranks and colors. In our method of teaching Kenpo (FILKENJUTSU), we do not currently use the red belt. For example, the highest ranking Black Belt in our family, is my father, Bruce Corrigan. He is the only 10th degree Black Belt in FILKENJUTSU and is the founder of our method of teaching. He prefers to just wear the Black Belt with ten stripes (or even just a plain Black Belt!). He also has a Black Belt with a red border which denotes that he is the founder/head of the family. At the end of the day, your belt is used to keep your gi (uniform) together. We often place a little too much importance on what color it is. And at a time when many martial arts have been watered down, and promotions have been sold rather than earned, what is most important is that you are training with a good teacher who also has legitimate training. Wait, if you're reading this you are training, right? If not, please call me NOW at (865)481-8901 or email me at dcorrigan@pmaoakridge.com and schedule a FREE private introductory lesson. It is free, and there is no obligation to keep training afterward. Come see for yourself why this will be the best decision you've ever made. That's enough for now, see you on the mat! What are some of your questions? Comment on Facebook or email them to me at dcorrigan@pmaoakridge.com and I'll try to cover them in future posts! I want you to think back to the time in your life just before you began training martial arts and visualize a scenario in which you may have been attacked at that point in your life. Maybe you started training when you were a teenager, and a realistic scenario might be someone giving you a hard time in high school. Or maybe you started training martial arts during your twenties, and a realistic scenario might be someone that’s had a little too much to drink at the bar you’re at with some friends. Or maybe you began training in your forties, and a realistic scenario is that someone having a bad day has a case of road rage and gets out of the car to teach you a lesson! Now, let’s imagine how that scenario goes down and how you might have responded to the attack, assuming that you can’t get away and the attack was physical. You haven’t learned how to throw a proper punch yet or how to parry a strike. You haven’t learned how to take down an aggressive opponent or escape from the mount. You haven’t learned how to prevent being killed by a knife-wielding attacker. I am proposing that it’s possible you would have done better defending yourself in that scenario than you would have after taking a few martial arts classes. It is highly unlikely that you will have achieved mastery with your martial arts abilities within a few months of training. Therefore if you are in the same scenarios we thought of above, but with a little bit of martial arts training, it is highly possible that you will hesitate and think about what you should do. What techniques are you going to use? In that moment of hesitation and thought, we could be overrun and beat up. You may have fared better had you been attacked before you began your martial arts training because you would not have thought about what to do. When the attacker threw a punch, you would not have thought about how to block it because no one would have ever taught you how to block it. Therefore you would have just reacted with some flinch response. And whatever that response is, would have been better than hesitating while you were trying to come up with the perfect response. Now, of course, there is still a high percentage chance you would not have handled the situation well without any training and be beat up or worse. All I'm saying is that it's possible that you could do worse with just a little training than had you done none at all. Over time, we will train your automatic responses to be effective and efficient responses of a martial arts master. These will eventually become your reflexes. How long? Bruce Lee used to explain this by saying that before you begin training, a punch is just a punch. Then, you start training and realize a punch is much more than you thought! You now are thinking about how you stand when you punch, how your body moves, which part of your fist to make contact with, what to do after you punch, and more! At some point, you train long enough that a punch goes back to just being a punch. Those other details are still there, of course, but they’ve reached the point of mushin which means you aren’t thinking about them anymore - you are just throwing a punch. This level of skill is IMPOSSIBLE in the beginning stages of training as the techniques have not been repeated enough for this to be possible. It is for this reason that at our academy students do not spar with each other until later in their training when they have had an opportunity to develop a solid foundation of proper technique, control, and reflexes - which will then be enhanced by sparring, not hampered by it. If caught in a scenario like the ones listed above, remember that all 3 of these were scenarios involving ego and can often easily be avoided. If you are caught in a scenario that cannot be avoided, try your best not to hesitate. The key will be to just fight. Helio Gracie is the founder of the famous martial art, Brazilian Jiu Jitsu. His son, Rorion Gracie, was my father's first teacher in Jiu Jitsu and the creator of the Ultimate Fighting Championship (UFC). Helio's quote above is one of my all-time favorites, and this past Winter Break I even had it put on the wall in our academy. The thing is though, when people see this quote and the word "triumph" or are told that martial arts teach smaller people how to overcome someone bigger and stronger than them, they tend to think that "triumph" or "overcome" means "to dominate". If you watch any footage of Helio Gracie fighting, you will see something much different. In the following fight, notice how Helio is thrown like a rag doll a couple of times before finally securing a move that will render his opponent unconscious and win him the match. This match is narrated by Helio's son, Rorion. You see, the primary goal of Jiu Jitsu is just to survive against your attacker. Ideally, that would end with you choking them unconscious so you can get up and get home safely, but it may be just protecting yourself until help arrives, or until such time that you can run away. Recently, I heard of a scenario in which an untrained male (internet troll) is claiming that he could defeat female mixed martial arts fighters because of how much stronger and faster the average man is. A female MMA fighter decided to take him up on the challenge, and it was held at an academy (as such a match would probably never be sanctioned by any organization). As a martial arts instructor, I have seen this exact scenario play out multiple times. We get the opportunity to see our female students, smaller male students, older students, or any of our students for that matter, train with brand new students who are just getting started. When I was a kid, I witnessed my Mom choke out a local wrestling coach with the same choke Helio used in the above video. I remember at age 18 watching my wife (girlfriend at the time), control a man that outweighed her by at least 80 pounds (of muscle). He started the match telling her that he was not going to use his strength. About midway through the match, he said, "I take it back, I'm going to use my strength." It didn't help. You see it isn't that size, strength, and speed don't matter. They certainly do, as we've touched on many times on this blog before. It's just that they CAN be overcome with training. One of the key takeaways from the video above is how quickly the in-shape male runs out of gas. An untrained opponent is not conditioned to fighting the same way as someone trained will be. In fact, not even close. I will always remember a student coming to train at our school here in Knoxville when I was a teenager. He was an Olympic marathon runner, sponsored by Adidas. Arguably, one of the most "in-shape" athletes on the planet. He can run 26 miles faster than almost anyone else alive. BUT, within 30 seconds to a minute of grappling, he was utterly exhausted - just like every other person that begins training in Jiu Jitsu. This alone is one of the most important reasons to train. Solely by training martial arts on a regular basis, you are preparing yourself physically and mentally for an altercation that your opponent will be grossly underprepared for if they do not train. We will teach you to weather the storm, and when their gas runs out, your opportunity to come out on top or to get away will present itself. The funny thing is, in the interview after the match, the man states that it went about the way he expected and that he dominated until he gassed. What he should have said is that he dominated until she dominated! While his strength and speed allowed him to win the early exchanges, it quickly deteriorated, to the point that he actually tapped out to the exhaustion. That means he gave up (defeated both physically and mentally) due to just exhaustion - not from being hit or submitted by something like a choke. At the beginning of this post I mentioned Rorion Gracie creating the UFC. Well that was now 25 years ago. At this past weekend's UFC event (the two hundred and twentieth event), we got to witness this exact scenario play out. In the main event for the Undisputed Heavyweight Championship of the world, Stipe Miocic weathered the storm of the fearsome striker, Francis Ngannou, to keep the belt and remain the UFC Heavyweight Champion. In the process, he set a new record for Heavyweight title defenses (3). The strikers are so powerful in this division, the fighters have an extremely difficult time keeping the belt for very long before someone else comes along and knocks them out. Francis Ngannou was promoted as the most fearsome Heavyweight to ever step into the octagon with the most powerful punch ever recorded at the UFC Performance Institute. In his last fight, Ngannou knocked his opponent out with one punch - an uppercut so hard that his opponent was lifted off of his feet by the punch. Ngannou came out swinging this fight too but had run into an opponent with a gameplan to avoid Ngannou's punches, use his wrestling and Jiu Jitsu to get the fight to the ground, and control him. Despite Ngannou's 20-pound weight advantage, he was unable to escape from underneath Miocic. He had zapped all of his energy trying to knock Miocic out and defending against the grappling positions with a lack of technique (he is still relatively new to the sport). The fatigue allowed Miocic to cruise to his 3rd title defense, but gave the rest of us another clean example of overcoming strength. “Getting in shape” is one of the most common New Year’s resolutions. It’s a great goal, but, unfortunately, it’s also one of the hardest resolutions to keep. We’re almost halfway through January, and many of the people who just knew 2018 was going to be their year to get fit, are already struggling - some may even have decided to give up already. Gym memberships skyrocket at the beginning of each new year, but while gyms may see an initial spike in attendance, those numbers quickly decline. Why? Because getting in shape is hard. We all know why physical fitness is essential. We grew up hearing about the benefits of exercise in elementary Physical Education and learned about body fat from unforgiving middle school bullies and learned about muscles and ligaments in high school health and physiology classes. As adults, we get to hear about the endless benefits of eating green, leafy vegetables and taking brisk, daily walks from our concerned mothers or spouses or doctors. No one here is arguing that exercise and a well-balanced diet are bad things - everyone knows they are good. That’s why so many New Year’s Resolutions are some variation of a physical, mental, or nutritional improvement. So we aren’t going to spend the next few minutes waxing on and on about why getting in shape is good for you. Instead, we are going to talk about all of the reasons it’s HARD, and look at a couple of strategies that might help you get through it. From my own experiences getting back in shape after periods of inactivity, I know that the first thing I have to do is get out of my own way. For anyone that has a job or a family, taking time for yourself - even just an hour or two a week - can leave you feeling guilty and even stressed. These feelings are totally normal but totally unnecessary. Taking time for yourself is vital for your overall well being, and as we all know from those elementary school PE classes, exercise can release stress and improve focus. Taking time for yourself can put you in the frame of mind to solve that problem you’ve been working on at your job or help you be more patient and present for your kids. How can you take care of your other responsibilities if you don’t take care of yourself? Get out of your own way, and unabashedly take time for yourself! While you’re getting out of your own way, let go of the negative perceptions you have of yourself and the perceptions you project, accurately or inaccurately, on the people around you. Being in shape should increase your confidence, but I’ve been merrily on my way to a healthy body and mind and found myself stuffed into workout clothes that I think make me look like a busted can of biscuits. Self-consciousness happens to the best of us, but we have to let those negative thoughts go. Everyone thinks they look weird when they run. No one’s stomach stays perfectly flat when they’re sitting down. Most people have a smidgen of fat on their arms that they think flaps in the breeze when they wave. I have wheezing asthma that makes me honk like a goose whenever I do aerobic exercise. Everyone has insecurities, don’t let them hold you back from everything you are capable of and everything you can be. And while you’re on the road to getting in shape, STAY IN YOUR OWN LANE. In the past, I’ve fallen into the habit of comparing myself to the people training around me whom I’m sure are thinner/stronger/faster/more graceful than I’ll ever be. Focus on your own accomplishments and strengths instead of dwelling on what others can do. Spend your time challenging yourself and learning what your body is capable of instead of being envious of what you see others doing. If you keep comparing yourself to others, you’ll never feel like you’re good enough. You might start thinking, “what’s the point?”, and give up when you’re really only just getting started. There will always be someone who is better at something than you are. You can’t be the best at everything; you can only do your best in everything. Let go of your spirit of comparing. Let me tackle the most obvious hardship of getting in shape last: It’s uncomfortable - even painful at times. Getting in shape is no joke. Your muscles will be screaming one minute and then feel like jelly the next. Your chest will get tight because you can’t breathe and you’ll feel like your heart’s about to pop, but somehow you keep breathing (or wheezing in my case) and your heart keeps beating, and eventually you finish that first jog. The first run turns into a second run that turns into a weekly run and then a daily run and before you know it you have run farther and faster than you ever thought possible. In the beginning stages of getting in shape, everything can feel overwhelming or difficult. It’s achieving that end goal that feels so good: fitting into that old pair of jeans, seeing your cholesterol or blood pressure go down, passing that stress test, or just having more energy to spend on your family or hobbies. So how do we get from exhaustion to exhilaration in one piece? Find an accountability partner. It can be a friend, family member, or a training partner. It can be as simple as discussing your goals together or strategizing for how you can help each other get there. My training partners started dragging me on a weekly run with them after I came back from an absence. The farthest I had run before these weekly meets was 1.5 miles - and I thought it was AWFUL. Before I knew it, I was running 3…4…5…miles with them, and the next thing I knew, we had completed a half-marathon together. It was one of the most rewarding experiences, and it will be a favorite accomplishment of mine (though I hope to never do it again…ever) forever. I would never have met my goals without their encouragement and, some days, them physically dragging me on my run to keep me accountable. Me and my training partners the morning of our 1/2 marathon! 2. Find something you love to do. I’m a martial artist, and I love it. My classes provide an excellent full body workout, and the supplemental workouts I do outside of class are to improve my skills as a martial artist (and also because I really like cake). I’ve found something that I love to do that keeps me fit and motivated. If you are looking to get in shape, discover that for yourself: dancing, running, rowing - there are endless opportunities. Fitness doesn’t have to be limited to a gym. Yeah, that's me. Scary, right? Finally, have the mettle to keep going. When the path to your goals gets uncomfortable, don’t give up. That goal is right in front of you if you only push through. Remember, you’ve come too far, to only come this far. You can do it; I believe in you! Many years ago, long before the term “Mixed Martial Arts (MMA)” was ever coined, this logo was designed. I chose the triangle to represent strength and improvement. A triangle represents structural strength, but it is also the mathematical symbol (delta) for incremental change. This change is what a good martial artist must continuously seek as necessary to remain effective. However, change doesn’t mean that you abandon your art for another – through the process of refinement and change, you make your art stronger and better. In my case; Kenpo. 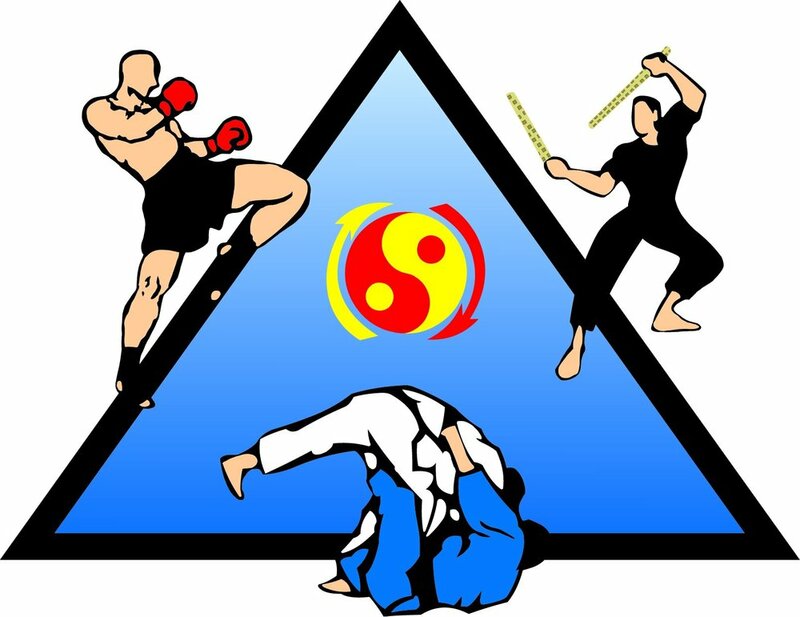 The three characters on the triangle represent the base concepts that develop the dynamics of my Kenpo. The kickboxer represents the use of constant and energetic movement along with the inclusion of aspects from every possible philosophy of kickboxing/boxing, i.e. western boxing, Pananjakman, Panantuken, Savate, American rules, European, Thai – and whatever else the future brings. The Kali warrior represents the dynamics of weapons; not in the form of just memorizing a weapons kata, but complete integration. This integration means – if I can do it empty hands, I can do it with weapons and vice versa. Weapons training will also significantly develop the awareness of range and entry into combat. The ground-fighters not only represent the full integration of ground and throwing arts, but also represent the study and mastery of the points of transition from vertical combat to horizontal combat and horizontal back to vertical. The center of the triangle contains the symbol “taijitu.” The color of this particular version of the symbol represents Jeet Kune Do (JKD). JKD is the root of the inspiration that “started it all,” and opened my path to acceptance, redesign, and change while still maintaining the art of Kenpo. This symbol also represents “integration to create one.” That means we don’t practice each art as a separate way but practice one art (Kenpo) that incorporates aspects of arts with other origins and primary focus. However, and probably more importantly, the taijitu (Yin & Yang) represents the natural balance of traditional with modern. If you only accept the modern and discard the proven methods of traditional arts or the way Kenpo develops a way of life which includes ethics, benevolence, warrior tradition, and health – you lose balance and meaning.